We hope that you will find our software to be the most intuitive, user friendly tournament software available. Most customers report running their first tournament within minutes of install. Please give us try! Take advantage of our 30 day free trial and determine if our software is right for you. Below are some of the features you will receive. 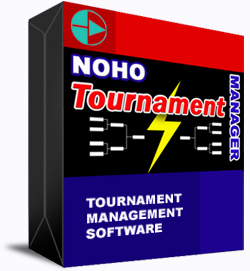 Below are some of the features you get with the NOHO Tournament Manager. Matches that can be played are highlighted for high visibility. Automatic advancement of players with byes. Automatic placement for late entrants. Open and save tournaments to disk. Run an unlimited amount of concurrent tournaments. Ability to upgrade or downgrade brackets in accordance with the number of participants. There is no need to reenter participants. Updates for minor versions are free. Check back frequently for updates. 16, 32, 64 and 128 single and double elimination brackets. You will be purchasing the unlock code which will extend the trial period indefinitely. Immediately after your PayPal payment is processed, PayPal will present your unlock code to you. You will also receive an email from sales@tourneyman.com containing the same information for future reference. If you already have the trial installed, you will simply need to copy and paste your unlock code into the Tournament Manager. You may want to consider whitelisting sales@tourneyman.com to guarantee you receive the email. We prefer PayPal for fast, easy, and secure payment of your purchase! PayPal no longer requires signup if you are paying via credit card.